Micky Adams has a footballing CV as long as your arm, having put in 438 appearances as a fullback for teams such as Gillingham, Leeds, Fulham and Southampton, followed by a management career that took in over a dozen clubs at every tier of English football. As a manager, Adams took the helm at some of the biggest clubs in the English football, including Leicester City, Brighton & Hove Albion, Nottingham Forest, Coventry City, Port Vale and Fulham, winning four promotions and a league title, as well as a reputation for bringing success and stability in often difficult environments. 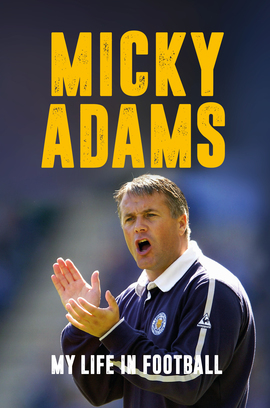 In this extraordinary autobiography, written with veteran sports writer and long-time friend Neil Moxley, Micky Adams reveals the truth behind incidents on and off the pitch including what really happened at La Manga, and what it was like to play with Shearer and Le Tissier in one of the most enduring careers in football. A fascinating, humorous and brutally honest account of life at the coalface of English football. Micky Adams earned hero status at several football clubs across England as a player and manager. This honest, engaging and revelatory account does full justice to his rich and varied career. Gritty and passionate beyond bloody-mindedness, Adams raises cutting your nose off to spite your face to an art form. He may call it principled, but sometimes, as each job unravels, you can only shake your head. Yet the honesty of his approach is matched only by that with which he tells his tales.